The flags have returned from Judy Warner in New York state. I was deeply moved by the image and her intention. 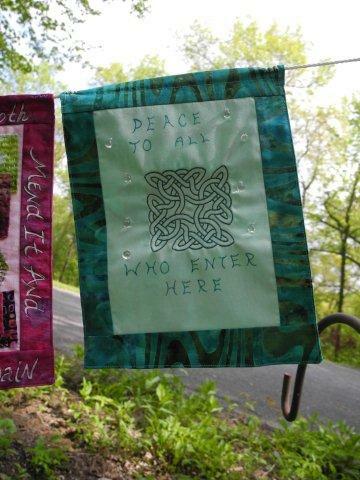 Judy shared with me that she drew on her Irish roots for this flag in choosing the celtic knot design - a symbol of peace. She wrote, "the script, Peace to all who enter here, simply filled my mind and heart when I meditated on the theme". The beads symbolize tears of hope. Thank you so much, Judy, for your thoughtful contribution! I recently found out about The 108 Buddhas Project by artist Bronwyn Simons from British Columbia. Over the course of one year, she will make 108 images of the Buddha, and documenting both the contemplative art making process, and the physical process of creating ceramics. 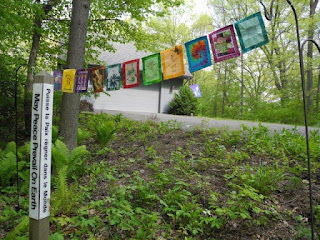 As a community project, she will also create small Buddhas for others to adopt, and put out in a place of our choice reminding all of us of our basic goodness. Such a lovely idea! I find the group connection so vitalizing...as it has been for the Bhavana Project. Sharing all facets of our life with kindness. I am happy to find more of these community projects blossoming out in the world. Read about Bronwyn's project on her blog. 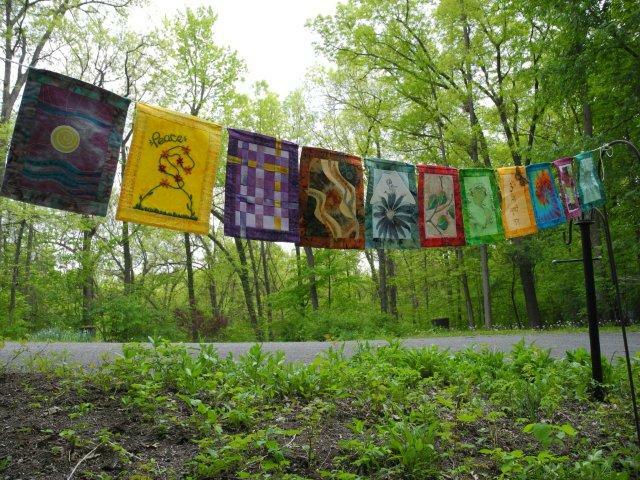 The Bhavana Project flags are winging their way to Judy Warner, a fiber artist living in upstate New York. Judy and I connected via SAQA's Visioning Project several years back. I look forward to her thoughtful input on the 11th flag of this project's third set.